Normally I wouldn't post two times in a row about the same project but I made quite some progress with my Tiny Hedgehog this week and wanted to share it here on the blog. As you may have noticed the Tiny Hedgehog now holds an Apple in his tiny paws (or paw as I still need to add the other paw) and I also added a rather fashionable scarf! I think the scarf (it's an infinity scarf can you tell?) is a real eye catcher with the fluorescent accents. I was unsure when I added the yellow neon colour but now I'm happy I went for a less obvious choice of colour. I have had these two Fluorescents Flosses (try saying that quickly 10 times in a row!) for a few years now and they are stored in my Floss Cabinet in a Ziploc bag with other less regular threads like DMC Jewel and Pearlescent effect floss. These fluorescent flosses are a bit easier to use than other metallic like threads (check Carina's Glitter Floss compare post!) but, as you can see in the photo, they tend to split instantly. However.... I was able to do a pretty passable Satin Stitch with it so it was worth the extra 'trouble'. :) DMC Light Effect Fluorescent Floss is most commonly sold in packages with four other Fluorescent Colours. p.s. 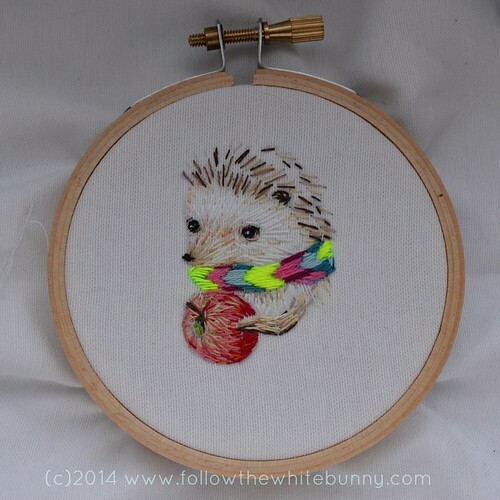 as you may remember I'm stitching my Hedgehog project for the &Stitches Finish-Along. There's still plenty of time to join in! So beautiful! The apple looks incredible and that fluorescent is a brilliant choice! The cutest hegdie! I love the little apple and scarf---nice additions! 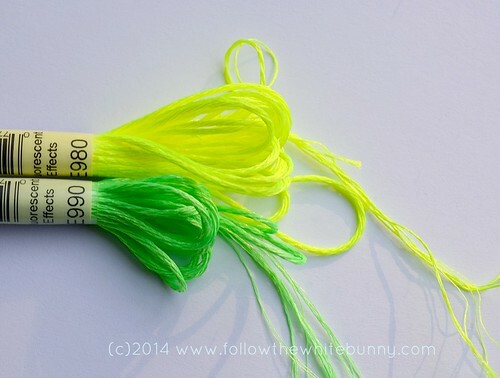 I have some fluorescent thread that I haven't been able to use because I always get too frustrated by it. But it adds such an amazing pop to the hedgehog! I might have to give it another try!